First things first. No water slide at any man-made water park will ever be the same again for me –- not after cascading down natural waterfalls in the Dominican Republic. 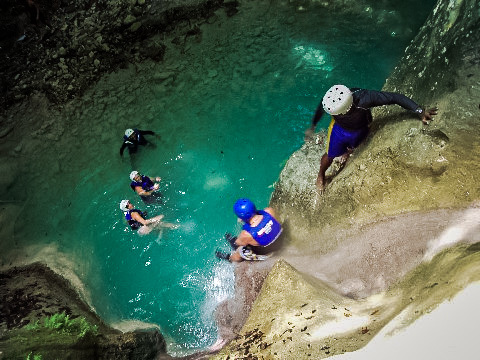 The waterfall escapade –- billed as 27 Waterfalls, though that’s really a misnomer, as it’s more like ten waterfalls flowing into twenty-seven pools of water –- is only one of a multitude of outdoor activities offered by the Dominican Republic eco-adventure tour operator, Iguana Mama. For many, a Dominican Republic (DR) vacation is a stay at an all-inclusive beach resort in Punta Cana, the most visited (read: touristy) destination in the DR whose admittedly beautiful beaches are lined with a succession of All-Inclusives. My husband and I didn’t go there. Instead, we opted for Puerta Plata, on the north coast, which also boasts lovely beaches but offers a wealth of nature-based adventures not available in Punta Cana. There, you can explore the countryside, meet the locals, visit off-the-beaten path communities and connect with nature. And, for us, the best way to discover the north coast was with Iguana Mama. Back at the waterfall, outfitted in a life jacket and helmet, we began our trek with an easy twenty minute hike to the first pool thru shallow, rocky streams of water. Note: closed-toe water shoes are a must. From there, we proceeded to swim, hike, climb and clamber our way to the top. My initial reaction was, “You expect me to climb up THAT?” And, even worse, “come back down?? ?” But the guides -– and it did take two -– flawlessly aided and abetted my ascent so that I hardly felt the exertion. Essentially, they pushed, slung and carried me skyward. The first few pools were the most difficult to navigate, but the guides were there to literally lend a hand –- or other body parts -– as needed. After the arduous climb, I’d hoped the descent would be a simpler matter. But the route down was via a series of surging natural slides or jumping off waterfalls into pool after pool of clear, flowing river water. Although the highest jump was a somewhat terrifying 20-foot leap, most were about the size of a high dive board at your local swimming pool. Line Freij, visiting from Sweden, described the experience as “a real adrenaline kick!” She confessed: “I was a little shaky in the knees after the first jump but after that, I felt like a pro. My favorite part was the slides.” The reward for making it down was a poolside picnic lunch. Standing in the water pools, with rocks protruding on all sides, I was surprised to look up and see a lush forest. The canyon was an other-worldly confluence of natural features assembled together in one magical place. As a change of pace from hurtling down cascading waterfalls, we opted for an Iguana Mama mountain bike adventure. One choice was a “Maximum Endurance ride”, a 45-mile “technical single track climb” that even the owner, Michael Scates, categorized as “hideousness and pain.” Hmmm –- not a lot to recommend it in my book. We opted instead for a gentle ride through the city of Cabarete and onto a dirt road past shuttered-down businesses that had fallen prey to a decline in tourism over recent years. Still, in every neighborhood that we rode through folks sitting on their porches enjoying a morning cup of coffee offered a friendly wave and warm “hola.” No hideousness, no pain. Along the way we stopped to taste exotic fruits picked off the tree and I wondered again why freshly picked fruits always taste so much better than those purchased in a supermarket. Then, much to our surprise, we ended up at a local zoo –- okay, maybe zoo is too strong a word. This was more a backyard with a few animals in it that had been transformed into a mom-and-pop enterprise. We were entertained by an iguana, resident turtle, a couple of snakes, a parrot, a flamingo and a crocodile, during an outing in which we’d expected to see none of these animals. Another outing was a hike through El Choco National Park. 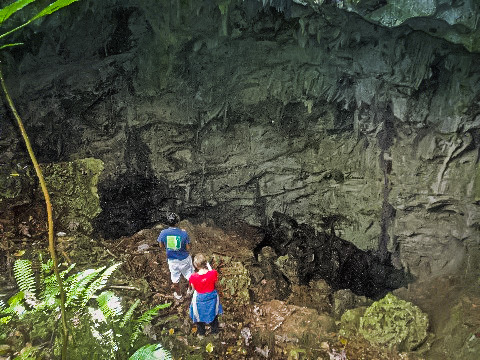 But as with every adventure at Iguana Mama, this was not just a hike; it also involved the exploration of a network of caves that added a whole new dimension to the usual walk in the woods. The stalactites and stalagmites, with their eerie and grotesque shapes and yawning divides, created a sinister and ethereal atmosphere in the caverns we explored. The faraway sound of chirping Coqui tree frogs helped to reinforce the ghostlike ambience of the caves whose pools of water were so clear that we didn’t even notice them until a sliver of rock caused the water to ripple. According to our guide, Carlos, stalagmites grow only one millimeter a year, and if you touch them, the grease from your fingers inhibits water absorption and stymies their growth. They didn’t appear any the worse for wear. Climbing down over rocks and roots, using vines for leverage, we entered a subterranean world and gained a personal connection with a natural environment hidden beneath the forest floor. Using jagged limestone outcroppings for support as I tentatively slithered down boulder over boulder, I left the forest behind and became immersed in a stalagmite jungle. The scramble back up was equally exhilarating. And because of Iguana Mama’s commitment to local businesses and the natural environment, I was able to forego my guilt about the hiking, biking, caving, diving, climbing, jumping and the general trampling of Mother Nature that we enjoyed during our stay. For more information about eco-adventures with Iguana Mama, visit IguanaMama.com. Fyllis Hockman is an award-winning travel journalist who has been traveling and writing for more than 25 years -- and is still as eager for the next trip as she was for the first. Her articles have appeared in newspapers across the country and websites across the internet. A sampling of those stories can be found by visiting seniorsoftheworld.com and clicking on The Travel Adventures of Fyllis and Vic.